I thought for for my sanity and for you guys who take the time out of your busy lives to read my blog to update you on what’s been keeping me from blogging. Other than close friends and family, no one has known why I’ve been distant since the beginning of Summer. I know I have disappeared off the face of the blogging Earth from time to time, for selfish reasons (school, work, wedding planning, etc. ), but this time it was for family. In the beginning of June, my sister was having migraines and wasn’t sure why all of a sudden so she was more or less on bed rest until the doctors could figure out what the hell was going on. Mid June she went to the hospital because nothing was changing and the frequency of her migraines began to get worse. Finally they had an answer, but it was one neither my sister or my family were prepared for; it was a tumor. They scheduled her for a biopsy which turned into surgery to remove the whole tumor instead, to be on the safe side. A couple weeks later, we waited to hear whether or not the tumor was cancerous; it was. We were relieved that it was removed, but now my sister had to wait to see what the next course of action was. Since it was cancerous and the tumor was a three to four on the tumor grade scale, she would have to do chemotherapy and radiation (chemo in pill form and a month of radiation at a facility). From the beginning, I have been living with my sister to help during her recovery after surgery and now her recovery with radiation. My sister has always been my best friend and I knew that being there for her, my nephews, and my brother-in-law was so much more important than anything else going on in my life, but I am grateful for my followers as well so I wanted to be honest and share with you. I have a post I’ve been working on, I’m not sure when exactly I will post it, within the next week hopefully, but I will be back soon. Happy Friday nerds and nerdettes! It’s almost Memorial Day Weekend here in the states, which means the first official weekend of going to the pool or beach. The fiancé and I will be doing neither unfortunately because the weather has been so crappy lately, and to be honest it isn’t even that hot here (shockingly!). So instead we’ll be spending time with my family at my sister’s for a cookout. I’m so excited! Memorial Day weekend is usually the kickoff of our summer adventures; fishing trips, drive-in movies, cookouts, and tons of swimming. Happy Happy Friday nerd and nerdettes! Mother’s Day weekend has fastly approaches and I am rushing to get my shopping done for Mother’s Day brunch with my mom and lovely sister. Besides spending this day with my mom and sister, I am in charge of providing deserts :)! So I must shop for a gift for madre and grab ingredients from the market to make yummy cupcakes. 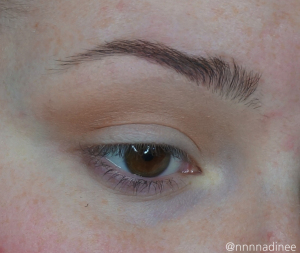 If you’re looking for a gorgeous warm toned neutral look, your search is over! I love this look by The Makeup Honey using Too Faced’s Chocolate Bar Palette. I hope you guys like this pic tutorial! My latest video is a Makeup Tour and its in Norwegian so i taught it would just be stupid sharing it here, so then i taught a pic tutorial would be fun! Today im using Too Faced Chocolate Bar, its beautiful and it smells amazing, and under you can se the colors ive used, where and with numbers so its easy to know what goes where! So to start with White Chocolate all over the lid, from top to toe. This just so we have a base to blend the other colors on and we also get that brow bone highlight! To get some color to the crease and to use as a transulant color I put Salted Caramel in the crease and blend it upwards to my brows.